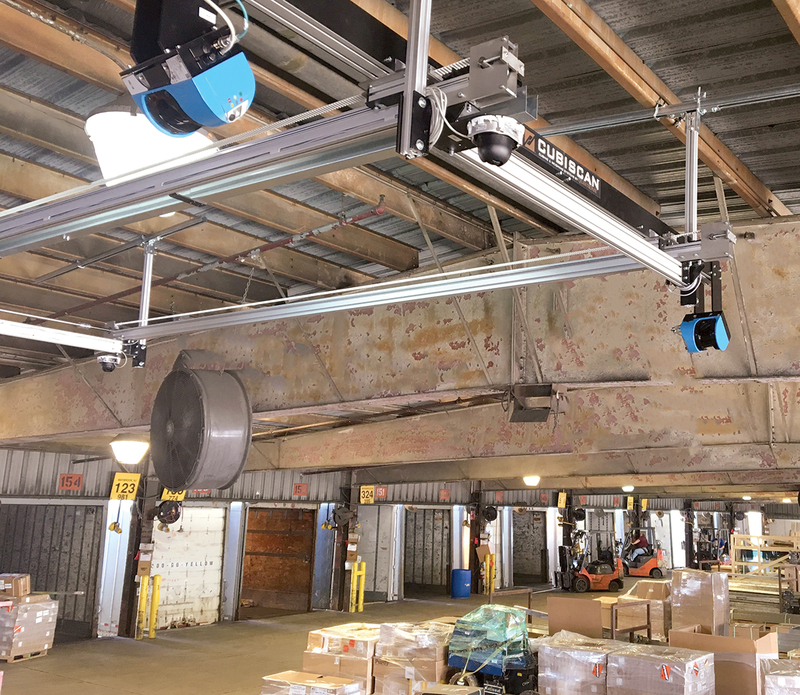 Increasingly, LTL carriers are implementing dimensioners on their loading docks and within their terminals to quickly and precisely measure the length, width and height of pallets to determine or validate pricing. Dimensioners can obtain this information in seconds, and the data are immediately stored in the carrier’s database. They also offer a camera option to take overhead images. A dockworker uses a forklift to drive the freight up to the landing zone, positions the freight under the scanner in the center of an outlined area and backs the forklift away. Estes Express uses forklift scales and floor scales to obtain the weight of shipments, Estes said. Although the vast majority of freight the company handles is on a pallet, shipments in virtually any form can be scanned in the landing zone. “It’s easy and quick to use, and we have multiple units at our facilities, so there are no long waiting lines,” he said. YRC Worldwide also has invested in technology to better measure the dimensions of the freight it distributes. The Overland Park, Kan.-based LTL carrier uses 88 dimensioners. YRC Freight dimensions about 40% of its freight on a daily basis, Hawkins said. The company uses computer algorithms to determine which freight to dimension and where the dimensioning occurs. As YRC moves a shipment, it may pass through multiple facilities equipped with dimensioners. YRC Worldwide ranks No. 5 on the Transport Topics Top 100 list of the largest for-hire carriers in North America. Estes Express, based in Richmond, Va., ranks No. 14. The data captured by dimensioning systems are yielding multiple benefits for LTL carriers. “It’s definitely helping us to refine our costing model to make it more accurate,” Estes said. YRC Freight is using dimensioning data to enhance trailer space utilization and optimize routes, Hawkins said. Certain shipments at YRC Freight are specifically targeted for dimensioning. “For example, freight that’s going to Alaska, Hawaii, or Puerto Rico needs to be dimensioned for ocean cube validation,” Hawkins said. The data collected by dimensioners also can play a role in contract discussions with shippers. Pricing accuracy is one of the fundamental reasons to use dimensioning technology. Carriers lose revenue when they ship freight that takes up more space than the shipper originally had indicated. “The data helps us ensure that we’re costing accounts properly for the space that is used on our trucks,” Hawkins said. UPS Freight also expanded its use of dimensioners this year, said Bob Topel, vice president of revenue management. FedEx Freight has more than 80 dimensioners deployed in its network, said Sean Healy, senior vice president of transportation, international, planning and strategy. “The dimensional scanners allow us to capture incremental revenue on shipments that are density-based commodities as well as capture information for our costing system so we can more accurately develop pricing for our customers,” he said. UPS Inc. and FedEx Corp. rank Nos. 1 and 2, respectively, on the for-hire TT100. The dimensioners used by Oak Harbor Freight Lines process about 8% of the company’s shipments. “We have randomizing programs which flag different shippers each day as we attempt to build a density profile on our entire book of business,” said Troy Jensen, the fleet’s director of pricing. The main reason Oak Harbor uses dimensioners is to ensure shipments are priced correctly according to their density and the space they utilize, Jensen said. Several vendors are supplying dimensioning systems to transportation firms. Estes Express uses dimensioners made by FreightSnap. YRC and Oak Harbor have installed CubiScan dimensioners. Mettler Toledo is another major manufacturer. Jason Wiley, business manager for transport and logistics at Mettler Toledo, explained how the technology works. For most customers, the dimensioning apparatus is attached to the ceiling or a column in the building, he said. Dimensioning heads that spread out in three directions send lasers at the object. The light is reflected back and detected by the photo detector in the dimensioner’s laser finder. Sensors detect how long it takes the light to reflect back from various points on the pallet, which enables the system to determine the dimensions of the object on the docking floor below. The scan alone takes 3 to 4 seconds, Wiley said. “The entire workflow — bringing the pallet over to the dimensioning area, entering the [tracking] number, conducting the scan and moving on with the pallet — might take around one minute,” he said. Carriers can use the data to optimize asset utilization by ensuring that proper-size trucks and trailers are allocated, Skeen said. “This, in turn, helps with aggregate asset allocation, resulting in less fuel usage, reduced wear and tear on vehicles and highways, and a greener environment,” he said. Dimensioners can handle freight that comes in all shapes and sizes, and not just on a pallet, FreightSnap CEO Michael Eichenberg said. “Often we must measure crates, boxes, heavy equipment and other freight that is irregular and not palletized,” he said. Besides carriers and shippers, third-party logistics firms are affected by the adoption of dimensioning technology. PNG Worldwide CEO Patrick Glavce said shippers might estimate the size of a load based on the dimensions of the boxes and the number of boxes, while forgetting to add the extra inches of the pallet. Diversified Transportation Services’ Doyle predicted that dimensioners soon will be ubiquitous in LTL operations. Major LTL carriers are unified in their praise of the benefits that dimensioner technology brings to their companies, particularly the ability to justify price corrections that capture lost revenue. Given the potential for higher freight bills, shippers might not welcome the spread of this technology. However, there are potential benefits on the shipper side of the equation. In order to ensure that all their invoices are in order, shippers frequently spend money to employ agencies to review and audit their invoices or to hire internal staff to do this, Hawkins said. In contrast, the density-based model is simple and straightforward. Estes, of Estes Express, agreed. “Density-based pricing is certainly a more accurate pricing model, and it’s much simpler to define, track and administer,” he said. PNG Worldwide’s Glavce, however, warned that companies should not expect quick changes.